Accelerated chondrocyte differentiation in the Hdac4-KO skeleton is a milder form of that in the Pthrp-KO skeleton. H&E staining of the proximal tibial growth plate (original magnification, ×100 [A–C, top]; ×40 [D, top]), the anterior rib cage (original magnification, ×40 [A and B, bottom]), and the anterior rib cartilage (original magnification, ×100 [C and D, bottom]) at birth (A and C), P8 (B), and P12 (D). 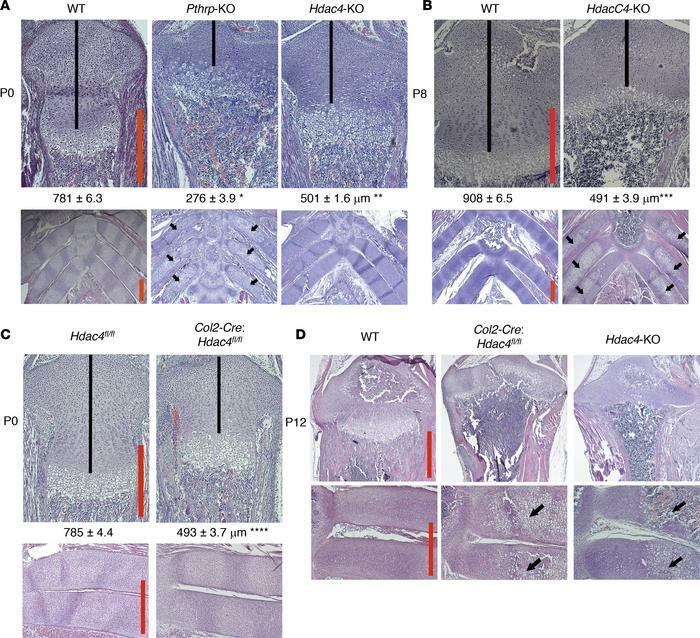 The mice with the same ages are littermates, except the Hdac4-KO mouse in D. To compare the Pthrp-KO mouse and the Hdac4-KO mouse precisely within the same litter, we mated the Hdac4/Pthrp double-HET mouse with the Hdac4/Pthrp double-HET mouse. (A). Numbers represent the average length of the proliferating chondrocyte region (shown by black lines) (mean ± SEM, n = 3, biological triplicates). *P = 7 × 10–7, **P = 6 × 10–6, ***P = 8 × 10–7, ****P = 3 × 10–6 by the 2-tailed Student’s t test, when compared with its corresponding WT measurement. A P value of less than 0.05 was considered significant. Black arrows indicate rib chondrocyte hypertrophy and mineralization that do not occur in the WT controls. Scale bars (red lines): 500 μm.